I always knew as a 12 year old that Posh Spice was the one to watch out for. Although she had a tendency to glower in the corner when she wasn’t gurning for the camera (this was the early days of the Spice Girls and she hadn’t yet perfected that signature pout), while Scary and Ginger dominated, Baby got all the young boys feeling all sorts of feelings and Sporty back-flipped them all under the table with her vocal capabilities, Posh was quietly constructing a fashion empire. What came first, I wonder, the fashion loving pop-star construct or the ambitious young woman harbouring dreams of designing? The reputation she built for being in to Image and “little Gucci dresses” (a direct quote from the seminal coming of age masterpiece, Spiceworld: The Movie) no doubt had a part in edging Victoria Beckham towards the fashion world, particularly when her solo pop career floundered. Collaborations on the catwalk with Roberto Cavalli sent her on her way, a jeans line was another step, and her very own fashion label was launched in 2006 to curiosity initially and then begrudging admiration. Even the most sceptical of critics now acknowledge her as a bona fide fashion staple. Her clothes are frequently seen on high profile personalities (including herself!) she has picked up a number of awards (including Designer Brand of the Year at the British Fashion Awards in 2011) and taking us to the present, her S/S16 show was pronounced as a roaring success to all and sundry, seeing her grow as an artist, expand out of her comfort zone while keeping her now iconic streamlined silhouettes and midi-lengths. The almost picnic-blanket gingham print screams summer in the city, and the asymmetrical pattern and cut adds interest to a classic shape. It moves really nicely, and though it’s styled with no-nonsense flats here I can also see it with a pair of strappy platform sandals or elegant stilettos. I hate to break it to any Breton top, nautical loving stylistas out there, but next summer the surf is most definitely up. 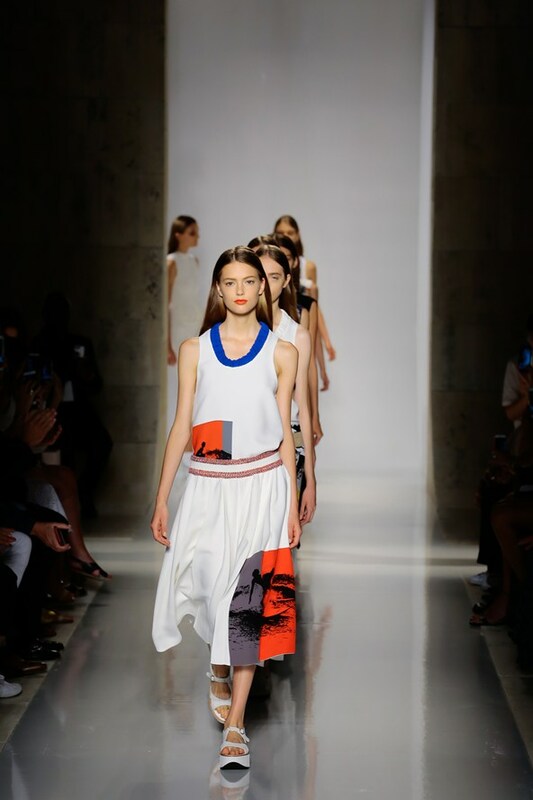 VB isn’t alone with the surfy, beachy themes (amongst others, Tommy Hilfiger had a Caribbean vibe, and BCBG Max Azaria not only had kaftans and low slung bags but bloody bucket hats), but she’s making it that bit more wearable for her stylistically simple leaning customer base. Orange is actually the new black, it’s pretty much official. It will be in unexpected places this A/W, but will carry on into next year so choose your pieces wisely. This is a lovely, elegant, easy look, maintaining the sportiness but with a lot of scope for dressing up, down or over. 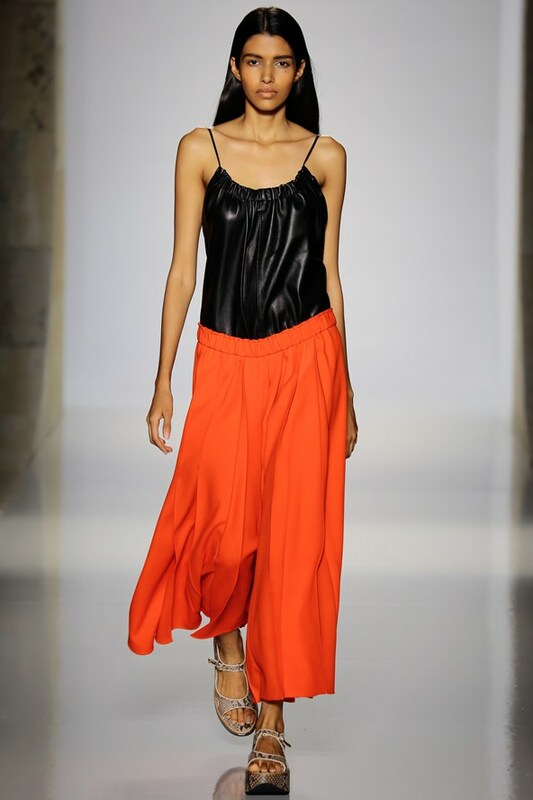 Love the hipster culottes – yup, that tricky trend is going nowhere. There’s a lot more colour and print in this year’s collection, seeing a notable evolution in the brand. 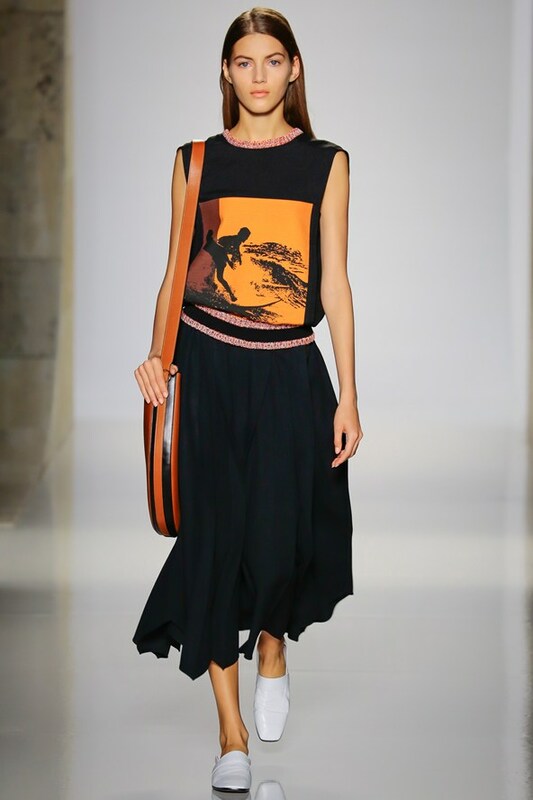 Beckham has nailed the upmarket beach girl stuck in the sticky summer city look perfectly, and if I don’t see variations on this collection trickle down on to the high street I’ll wear boat shoes and a life-jacket for a week. Her ‘half-moon’ bags are also getting notice (a bit of one is seen in the third pic above) and when a specific trend emerges from one designer’s show you know they’ve made it. It’s a long way from the days of lip-syncing in a yellow and black striped dress, or even her Rock & Republic denim collab, and there’s a long career ahead for Victoria Beckham.